This is a creation inspired by a morning walk around my garden.....streaks of sunshine going thru' the flora and fauna after a cool night with dewdrops on leaves and flowers and faint mist when the sun warms up the cool earth. 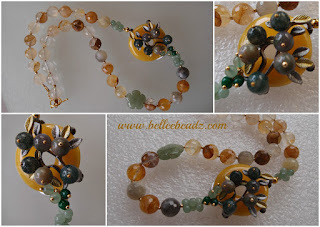 14mm faceted citrine rounds, green aventurine elbow beads and carved flower and a gorgeous yellow aventurine donut embellished with Indian jasper beads taking on the role of flowers. One of the many pieces I can't stop admiring. Almost 22" in length.